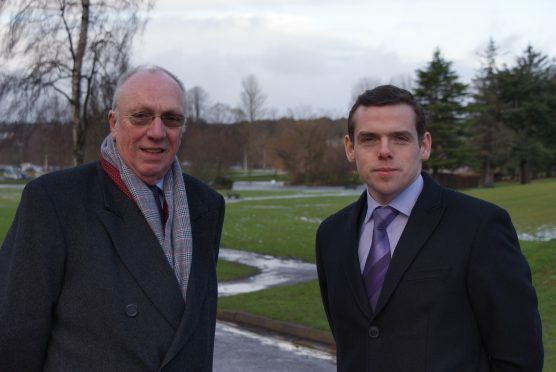 Highlands and MSP Douglas Ross, pictured right, has praised the experience of Elgin City North candidate Frank Brown. A former RAF airman has put himself forward for election to Moray Council again – after missing out by less than the margin of a single vote four years ago. Frank Brown has been chosen to contest the Elgin City North ward in May’s local election for the Conservatives. In 2012’s poll, the former RAF Kinloss crewman remained in the running to win a seat until the fourth round of counting. Due to the nuances of the single transferable voting [STV] system, which sees candidates ranked in order of preference, the winning margin Patsy Gowans had over him for the final Elgin North post was less than half a vote. However, far from being deterred by the narrowest of losses, Mr Brown has placed revitalising Elgin’s town centre, schools and health care at the top of his new campaign. He said: “With three small grandchildren locally, I am acutely aware of the importance of quality education and I would seek to build on the efforts the council is already making to attract good teachers to Moray and give parents more say in the running of their children’s schools. After leaving the RAF, Mr Brown worked as a social worker in Elgin before holding senior posts at local authorities and health services in England and Wales. The candidate has now returned to Moray and recently worked for a carer’s charity and served as a member of the Children’s Panel. Elgin City North currently has three SNP councillors following the resignation of Labour’s Barry Jarvis in 2014 and the election of Kirsty Reid in his place.